Feasting on Hong Kong Roasts! Some food just never goes out of trend. Some never cease to satiate foodies like me. Some just are classically delicious and can never be enough for anyone. One of these kinds of food is the much consumed and much sought after Chinese roast meat and poultry. Yes, I am talking about Roast Pork, Roast Duck, Roast Chicken, Char Siew and more but you get my drift, right? I swear a plate of Roast Pork would make my day 10 times better than anything else. So when we were invited to Master Chef Kitchen by Chris from Pureglutton, we were excited at the thoughts of glorious Hong Kong style roasts meat and poultry. 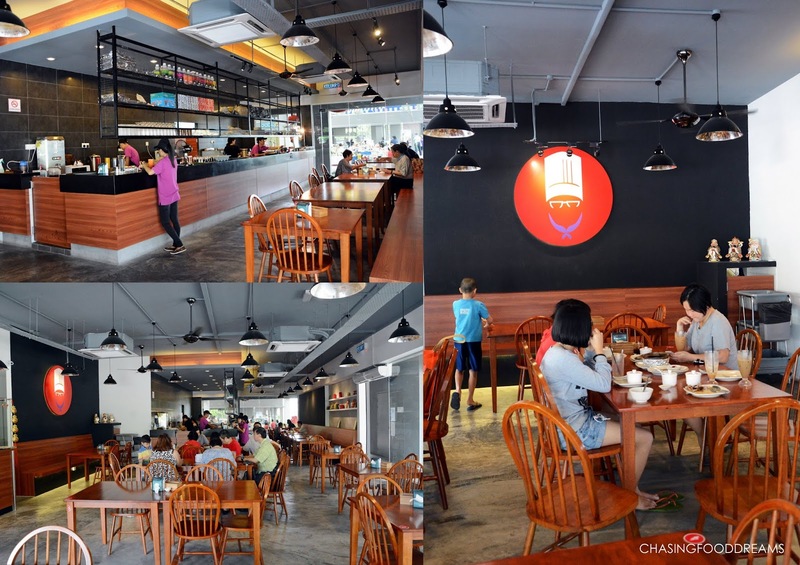 Master Chef Kitchen is located at One City in Subang. It is set in a shop lot at the Garden Shoppe outside the big One City mall. It’s been 3 months since they have opened and many have yet to be aware of the signatures of their Hong Kong style roasts. Master Chef Kitchen’s roast master hailed from Hong Kong and has more than 20 years of experience in the art of Roast. The ambience is spacious, simple and neat. It’s decorated with simplicity in mind with basic wood furniture, tiled walls, practical cement flooring and industrial lamps. There is a long counter where diners can catch some kitchen actions. Choose from regular seating tables to banquette seatings. Master Chef Kitchen’s menu highlights their Hong Kong roast meats and poultry but they also have a list of Chinese dishes that one can enjoy with rice or noodles. Before our mains arrive, we had soups. Now we all know that it is pretty much a must for most Chinese meals, especially Cantonese, to start a meal with soup. A good soup should have great depth of flavours with good base of meaty essence. Suffice to say, Master Chef Kitchen does a few types of double-boiled soups in their menu. We had two and both are beautifully tasty and comforting. 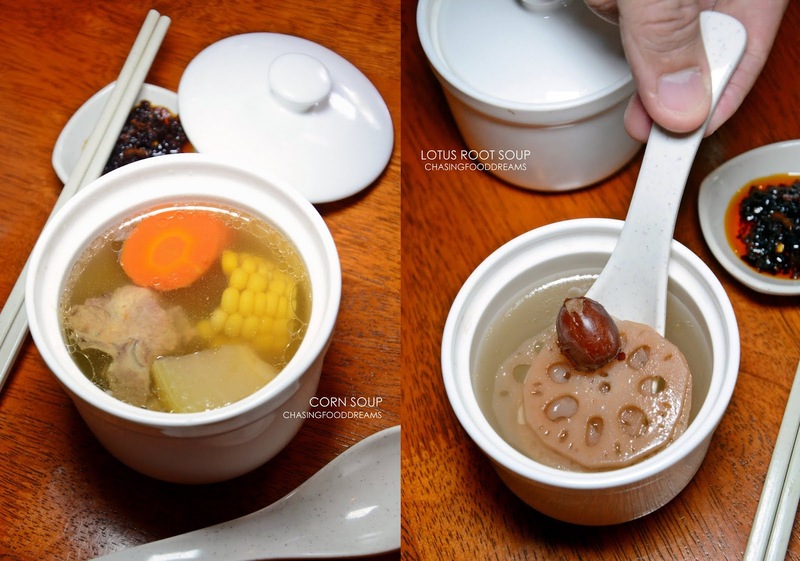 Homestyle Lotus Root Soup and Sweet Corn & Buddha Palm Soup have all the makings of a full-bodied soup with lots of warming essence. The chef uses sufficient ingredients hence both soups are delicious from the long hours of simmering. The first dish to arrive was Beef Char Siew (RM25), an unctuous plate of Australian beef marinated and roasted till tender and doused with a robust and sweet Char Siew sauce. The dish is perfected through time and even won an award under beef category in a Chinese Muslim culinary competition. It’s got a heavier beefy flavour than the classic Char Siew but nevertheless tasty and fork tender. Roast Duck (RM16 to RM68) is another signature that one must try at Master Chef Kitchen. Chef Chan uses a younger duck for his roast because the duck has less fat and has a finer meat texture. The Roast Duck has a gorgeously hued rich deep amber lacquered skin. The skin is superb in taste while the flesh is tender, juicy and flavoured with a scent of spices and herbs. Served in its own jus, we simply cannot get enough of the Roast Duck. Another unique signature of Chef Chan is the Long Jing Tea Smoked Chicken (RM18 – RM50). Chicken braised in special ‘lou sui’ and then smoked with Dragon Well tea leaves. It is served with a dark aromatic sauce that is lightly savory and sweet with a nice tea aroma. The chicken is moist and goes well with the side of Hong Kong style ginger and spring onion sauce. To go with all the luscious roasts, Master Chef Kitchen serves rice and noodles as well. We had their Fish Soup Wantan Prawn Noodle which is available in soup or dry. The wantan noodle has got a good firm bite and is sufficiently dressed in the classic soy sauce for the dry version. The soup version is also comforting and tasty. Prawn wantans fared well too with a good filling of prawns. We also tried some a la carte dishes from their dinner menu as well. Master Chef Kitchen serves up more comfort classics such as Braised Soft Pork Ribs and Steamed Fish with Bean Curd and Wood Fungus. The Braised Soft Pork Ribs is a pretty satisfying dish to be enjoyed with rice. The salty notes of the thick sauce enveloped the soft pork ribs beautifully together with pieces of tender carrot and radish. It’s moreish and lip-smacking yum! Fish lovers will be please at the choice of Steamed Fish with Bean Curd & Wood Fungus. It’s a Cantonese classic that highlights the fish well as the delicate bean curd or tau kan and wood fungus are both light in flavours. Coupled with the supreme soy sauce, one can really enjoy the freshest of the fish that way. For vegetable, we had a very delicious Stir Fried Lotus Root with Nuts and Fermented Bean Curd. This one is really yummy and all the ingredients worked well together. Lotus roots, celery, almond flakes and macadamia nuts are given a quick stir fried and every ingredient retained its lovely crunchy textures. Chef Chan also has a few Hong Kong snacks under his menu. Hong Kong style Baked Polo Buns and Kai Tan Chai or Bubble Waffle proved to be a hit, especially the Kai Tan Chai! Master Chef Kitchen also has lunch sets available and for under RM10, diners gets to choose from 21 options from their lunch set menu that also comes with free drink. Highlights of Master Chef Kitchen are all their Hong Kong style Roasts, homemade soups and Kai Tan Chai of course! Love the look of the beef...and the claypot pork ribs too. I would prefer the crust of the pork to be a little darker...and the roast duck not drowned with the sauce. Food as stated don't exist anymore. The shop downgraded. No many stalls like normal low end shop without aircond also. Unfortunately pricy.